Any aircraft document...anywhere in the world...at anytime. Manage your entire aircraft and engine portfolio with the click of a mouse, right over the Internet. Gain the power of an advanced financial and maintenance records management team all for one low monthly subscription. The Aircraft Group developed TAG Fleet Online to simplify and automate the tedious task of aircraft data and portfolio management. With TAG Fleet Online, digitized images of traditionally formatted aircraft records are fully searchable in seconds...not days. Whether the data was stored on paper, microfilm, CDs, DVDs or electronic files, it can all be readily available over the Internet. TAG Fleet Online gives you immediate access to inspection data, history and program data, airworthiness and registration data, lease agreements & legal documents and more. If your responsibility is maintenance or aircraft financing, TAG Fleet Online delivers. Need an inspection photo? An engine's maintenance records? Or quickly trace an engine or review its utilization records? Simply select the aircraft or engine's serial, registration or model number and the relevant documents are immediately displayed. All documents in the archives are fully searchable and displayed as images of their original form. Easy to navigate entry fields allow you to update information in real-time and quickly generate reports for further analysis. Plus, TAG Fleet Online includes a proactive feature that monitors operator contractual and maintenane obligations, sending email alerts that YOU establish. You gain a complete, full-time records management and compliance department for one low monthly fee. Selling an airplane? With TAG Fleet Online, buyers or lessees can conduct due-diligence reviews right online saving thousands in time and travel costs! Ever had to repossess an airplane? Stay in control of your data. 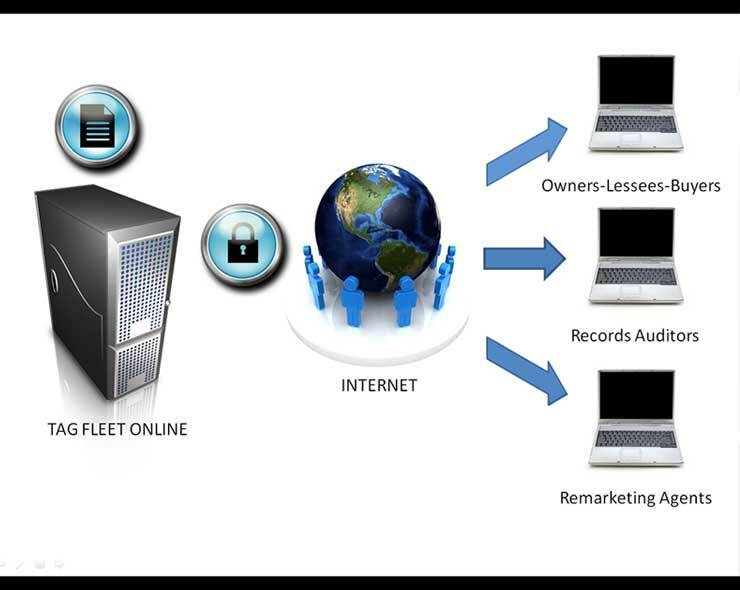 With TAG Fleet Online documents will never be lost, misplaced or disorganized and you will never have to buy records back from the bankruptcy estate. And, transaction times from start to finish can be reduced by up to three weeks saving thousands of additional dollars. Even day-to-day maintenance of account records is simplified with TAG Fleet Online. Check on your monthly operating status, payments made or received, generate reports on your maintenance reserve balances and more. All associated information and documents are just a click away allowing you to research and review your aircraft status in seconds from anywhere in the world, at anytime. It couldn't be simpler. Offers temporary or limited user access for equipment inspectors, appraisers, brokers, anyone who needs access to the most timely information. Automatically tracks scheduled maintenance and sends non-compliance alerts to ensure that your aircraft is maintained. Immediately updates and tracks records as they are added or modified simply by clicking, typing and saving. Easily compiles aircraft data for comparison with images and summary data on each aircraft clearly displayed. Generates printer-friendly reports of engine maintenance, utilization, payment/invoicing history and more. Allows authorized users to perform all aircraft financial and maintenance research right from a desktop or laptop anywhere in the world. Conduct cash-flow analyses or lease projections in minutes right from your desktop.